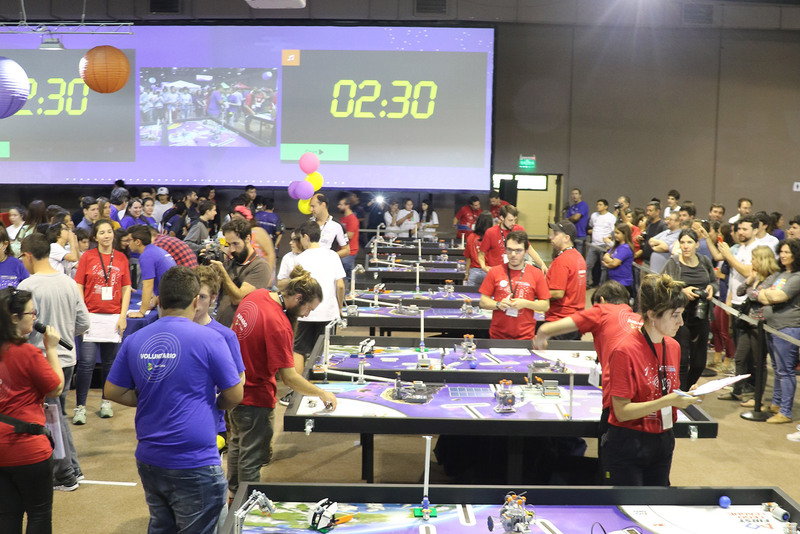 The 5th edition of the Olympics and the 3rd edition of FIRST LEGO League took place on November 7-8 at LATU Technology Park (a few steps away from our GeneXus offices in Montevideo, Uruguay) to share experiences and highlight the best work in Robotics and Programming developed in educational centers throughout the year. The event was organized in the following categories: Programming, Robotics, App Generation, FIRST LEGO League, FIRST LEGO League Jr., Programmable Boards and Drones Challenge. For two days, the property was filled with students between 6 and 18 years old, who enthusiastically showed the work done with their teachers throughout the year. Many advanced students and robotics teachers from various high schools came to learn about the history of robocars, the possibilities of autonomous vehicles in Uruguay, and the community around DIY Robocars. It was the ideal track for our robocars to ride in autonomous and command mode! The children’s interest in robocars was amazing. Endless queues were set up to manage the cars, including about 400 school-age children and young people at heart. To enhance the experience, we enabled the minimum software required for them to play with the cars, with a remote control and a couple of robocars that wandered autonomously. In one moment there were 5 cars at a time on the track, each driven by a human or artificial intelligence, in coexistence. What interested the children the most was how we made it possible for a real car to be managed with a PlayStation control … High school students asked directly what control board we used, whether it was Arduino or Microbit (the one used by Ceibal). We also had older people asking about artificial intelligence. The GeneXus / ThalesLab team worked like clockwork, tirelessly and barefoot to be able to run on the track, rescuing tangled cars, bringing them from the middle of the park, loading and changing batteries, putting back to work those cars that broke in the process, and answering questions at the same time, trying to make groups to distribute the cars among dozens of children with their hands raised asking for a turn.